As the end of summer draws near, I grow more and more excited about fall. The cooler weather, all the fun fall festivities and of course, football season! Some might find it hard to believe, but I love college football! I love the pride college students and alumni show for their team. I love bonding with new friends and old at a tailgating party while devouring game day food. And I love the intensity of the game. In fact, not only is Texas the home to Tex-Mex, BBQ, and the Alamo; football is considered a religion here! : ) Texas A&M and the University of Texas have a long standing rivalry, spanning decades. However, in my family, the friendly football feud is between myself and my brother-in-law. My in-laws are from Georgia and so my brother-in-law, “S,” is a huge University of Georgia fan. But I bleed maroon through and through! So every fall, for the past 8+ years, my brother-in-law and I have bonded over college football. Following each others teams, cheering each other on, watching games together and of course some friendly teasing and competition! As a good will gesture, to get get our football rivalry off to a fun and friendly start and get us excited for football season; I wanted to come up with a special treat to share with my brother-in-law. Then when I saw these new Jell-O University Molds, over on Walmart.com, I knew instantly what I wanted to make. These Jell-O University Molds are available (to order online) for a variety of universities and come with coordinating flavored Jell-O; making it easy to show your team pride! 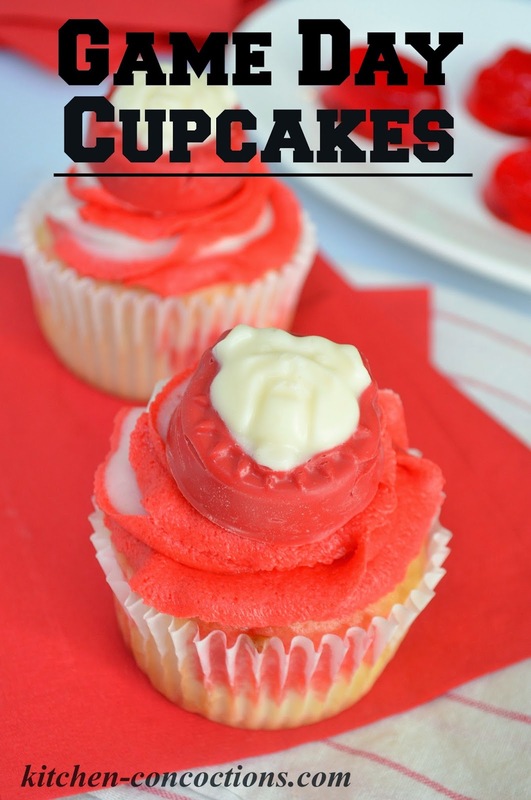 Use the molds to make team Jell-O jigglers for tailgating parties or make some of my easily customizable Tailgating Cupcakes! These cupcakes have several steps but are really easy to whip up ahead of time. 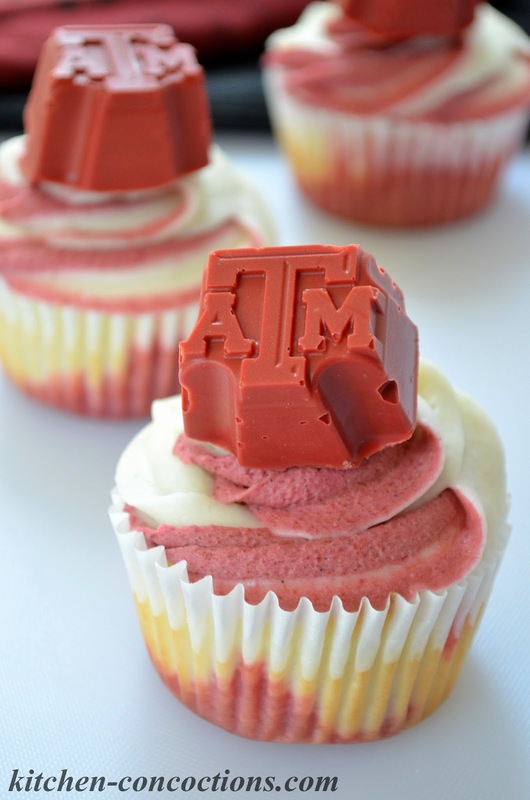 Even though I made University of Georgia cupcakes for “S” and Texas A&M cupcakes for myself; feel free to adapt the recipe for your favorite team! 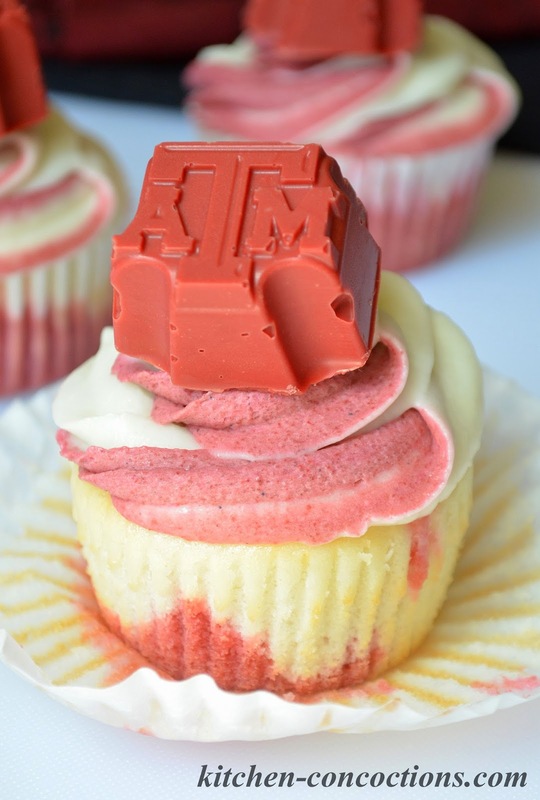 Show team spirit with these easy to customize game day cupcakes! In a large bowl, mix together the cake mix, sour cream, oil, and milk; stirring until completely mixed and no lumps remain. Fold in egg whites. Spoon batter into prepared muffin tin. Bake cupcakes for 18-20 minutes, or until top is springy to the touch and a wooden toothpick inserted into the center of the cupcake comes out clean. Cool cupcakes for 15 minutes in pan, then transfer to a plate. Meanwhile, pour Jell-O mix into a small bowl. Pour boiling water over Jell-O mix and stir for 3 minutes, or until completely dissolved. Immediately stir in cold water and stir for one minute. 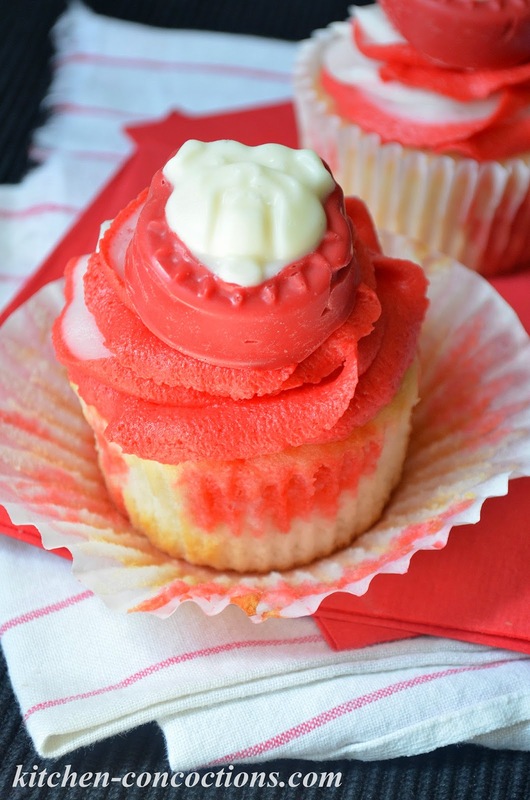 Once cupcakes have cooled, use a flavor injector, to pierce the top of the cupcakes, 4-5 times, and inject the prepared Jell-O mixture (be careful not to overfill the cupcakes with Jell-O). Alternatively, cupcakes can be pierced with a wooden skewer or fork and the Jell-O mixture carefully spooned into the holes. Refrigerate Jell-O filled cupcakes for 2-3 hours before frosting. To frost, pipe frosting onto chilled cupcakes. Top frosting with mascot cupcake topper. Store cupcakes in refrigerator. In a large bowl, cream butter until fluffy. Slowly beat in powdered sugar, one cup at a time alternating with the milk, mixing until desired consistency is reached. Once frosting is at stiff constancy, remove half of the frosting from the mixing bowl and set aside. To the remaining frosting, beat in Jell-O mix, mixing until fully incorporated. Add additional milk, if needed. To frost, fill one 12-inch decorator (piping) bag with white frosting and another 12-inch decorator (piping) bag with colored, Jell-O frosting. Push the icing all the way to the small end of each bag. Using a rubber band or twist tie, tie off the top of each piping bag. Place a large cupcake tip, in desired shape, into the bottom of a 16-inch decorator (piping) bag. Add both filled piping bags to large piping bag, making sure both bags are lined up and to the frosting tip. To pipe, squeeze icing down to the opening from the top and apply even pressure to both frostings, turning piping bag in a circular motion as you go. Place candy melts in microwave safe bowl. Add ¼ teaspoon of oil for every 6-9 ounces of candy melts. Microwave for 30 seconds. Remove from microwave and stir. Return to microwave for an additional 30 seconds. Stir again and repeat heating and stirring process until candy melts are smooth and melted. Pour melted candy melts into Jell-O University Molds. Let candy melts harden in molds for 1-2 hours. 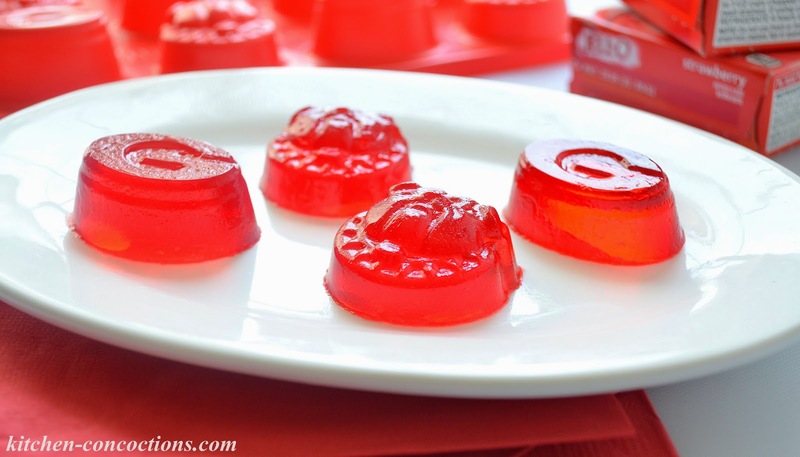 To remove from mold, place filled Jell-O molds in freezer for 15-20 minutes. *Note: For the Texas A&M cupcakes featured here, I used a mix of cherry and grape Jell-O and for the University of Georgia I used strawberry Jell-O. For deeper team colors, food coloring may be added.